Mk 10:44 “And whoever of you desires to be first shall be slave of all. and to give His life a ransom for many." Observations: 10:45 This verse occurs at the climax of Jesus' training of His disciples, sandwiched between the two accounts of healing blind men. The disciples understood that Jesus was the Messiah, but didn't get that the route to glory was along the road of suffering. The disciples were concerned about who was going to be greatest in the kingdom. Jesus didn't rebuke them for their desire, since the plan of creation is to glorify those faithful to God, but did correct their methodology. Greatness and glory weren't obtained by jockeying for position but by service, as Jesus demonstrated with His own life. The Son of Man, Jesus' favorite title for Himself, out of Daniel 7:13-14, is the one to whom all glory and dominion is given, which He shares with His loyal companions. He received the glory because of His service (Philippians 2:7-10), in which He laid aside His rightful glory to serve us by dying for our sins. 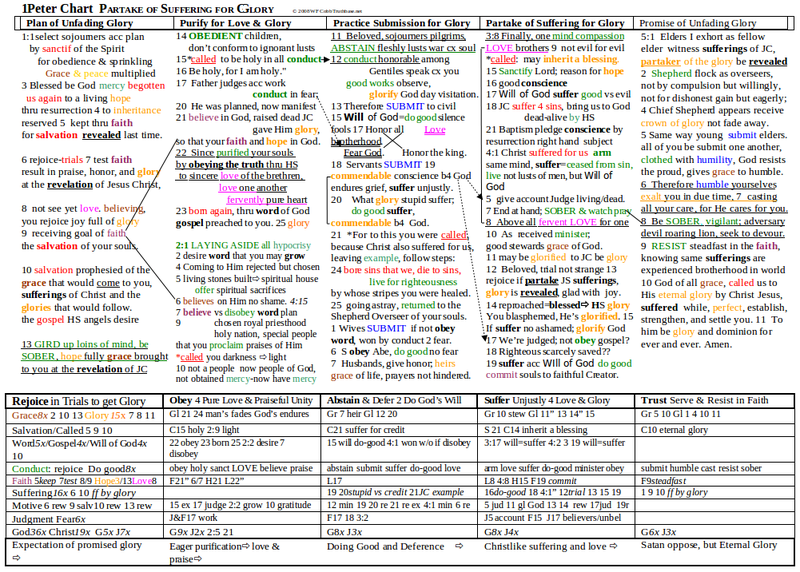 See comments on the two-stage miracle in Mark 8-10 for the context. Prayer: Lord Jesus, thanks for Your model, and service on my behalf; please guide me in using the life You've given to me, for the purposes that would most please You. Amen. 1 Peter 1-2 Peter writes to the Jews who probably believed in Christ at Pentecost, and were being persecuted and scattered as a result. He reminds them of the hope that awaits those who are born-again by faith in Christ, so they will obey God and reap their reward or inheritance when the Messiah returns and is revealed. The first chapter is an excellent demonstration that the Christian life (salvation) doesn't end with being born again (justification) but continues through becoming purified and holy as God is holy (sanctification), and culminates in being given glory when God judges and rewards them (glorification). Please put the effort into understanding it; doing so will result in both you and God gaining glory. The second chapter exhorts us to abstain from temporal desires so we can do God's desires and merit grace (check it out). Christ died for us so we can die to sin, and live for God. 1:1 Peter, an apostle of Jesus Christ, to the ones who are living as strangers in the Dispersion in Pontus, Galatia, Cappadocia, Asia, and Bithynia, 2 Elect/choice according to the foreknowledge of God the Father, by sanctification of the Spirit, that you may obey Jesus Christ and be sprinkled with his blood: Grace to you and peace be multiplied. 3 Blessed be the God and Father of our Lord Jesus Christ, who according to his great mercy has begotten us again to a living hope through the resurrection of Jesus Christ from the dead, 4 to an incorruptible and undefiled inheritance that doesn’t fade away, reserved in Heaven for you, 5 who by the power of God are guarded through faith for a salvation ready to be revealed in the last time. 6 In which you greatly rejoice, though now for a little while, if need be, you have been put to grief in various trials, 7 that the trying of your faith, which is more precious than gold that perishes even though it is tested by fire, may be found to result in praise, glory, and honor at the revelation of Jesus Christ— 8 whom not having known you love; in whom, though now you don’t see him, yet believing, you rejoice greatly with joy unspeakable and full of glory— 9 receiving the result of your faith, the salvation of your souls. 10 Concerning this salvation, the prophets sought and searched diligently, who prophesied of the grace that would come to you, 11 searching for who or what kind of time the Spirit of Christ, which was in them, pointed to, when he predicted the sufferings of Christ, and the glories that would follow them. 12 To them it was revealed, that not to themselves, but to you, they ministered these things, which now have been announced to you through those who preached the Good News to you by the Holy Spirit sent out from heaven; which things angels desire to look into. 13 Therefore, prepare your minds for action, be sound-minded and set your hope fully on the grace that will be brought to you at the revelation of Jesus Christ— 14 as children of obedience, not conforming yourselves according to your former lusts as in your ignorance, 15 but just as he who called you is holy, you yourselves also be holy in all of your behavior; 16 because it is written, "You shall be holy; for I am holy." 17 If you call on him as Father, who without respect of persons judges according to each man’s work, pass the time of your living as foreigners here in fear: 18 knowing that you were redeemed, not with corruptible things, with silver or gold, from the useless way of life handed down from your fathers, 19 but with precious blood, as of a faultless and pure lamb, the blood of Christ; 20 who was foreknown indeed before the foundation of the world, but was revealed in these end times for your sake, 21 who through him are believers in God, who raised him from the dead, and gave him glory; so that your faith and hope might be in God. 22 Since you have purified your souls by your obedience to the truth through the Spirit for sincere brotherly affection, love one another from the heart fervently: 23 having been born again, not of corruptible seed, but of incorruptible, through the word of God, which lives and remains forever. 24 For, "All flesh is like grass, and all of man’s glory like the flower in the grass. The grass withers, and its flower falls; 25 but the Lord’s word endures forever." This is the word of Good News which was preached to you. Observations: 1:1-2 Peter writes to those who are special or select in God's sight, but dispersed and despised in the world's sight. The places where they were scattered are similar to the homelands of those who were present at the day of Pentecost in Acts 2. They are elect or choice according to the plan or foreknowledge (know ahead of time) of God, set apart or sanctified (for His purposes or to be His people) by (en=means) the work of the Holy Spirit, for the purpose (eis) of obedience and the sprinkling of the blood (basis of a covenantal relationship just like Moses made with Israel in Exodus 24:8). Note that this is not justification, and that obedience precedes the sprinkling. There is no mention of faith yet. Some people mistakenly think blood is always in reference to forgiveness of sins, but that's not true, and particularly doesn't fit this context, which is about having a covenantal relationship with Jesus the Messiah which results in the covenantal blessings of grace and peace being multiplied (again, not about forgiveness). 1:3-5 Peter blesses God because, according to His great mercy has caused us to be born again, to a living hope. Notice that the emphasis is not on being born again, but that to which we are born again, to (eis) a living hope. That hope is based upon not the death of Christ (which is what our being born again is based upon) but upon the resurrection of Christ. If He is resurrected, we will be as well (1Cor 15). 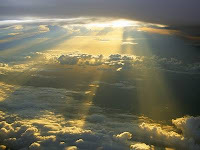 Verse 4 elaborates that the hope is to (eis) an inheritance, reserved in heaven for God's people, but only those who are preserved by faith in God's power. Someone can reserve a hotel room, but unless they show up to occupy it, they don't enjoy or possess it. Similarly, born again believers have an inheritance reserved for them, and God's power can protect them from all the dangers that they will encounter from their present to their future, but unless they tap into that power by exercising faith, they might not arrive at the destination God has planned for them. This hope of reward is the salvation or glorification which is ready to be revealed in the last time. (cf Titus 2:14 “the blessed hope, the appearing of the glory”). Justification or forgiveness, the first aspect of our salvation is our present possession as a result of faith in God's gracious provision of Christ as our sin-bearing substitute. Glorification, the final aspect of our salvation is also a result of faith, but faith in God's power (which the epistle will tell us about). Glorification is the inheritance for which we hope, because it is not our present possession. It will be revealed at the revelation of Christ, as the rest of the chapter explains. 1:6-9 Even though many in Peter's audience are being chased for their faith, they are rejoicing in their inheritance, or hope of reward. Their faith in God's power is being tested and tried (refined like gold is, but the fire of affliction), and may result (subjunctive) in praise, glory and honor at the revelation of Jesus the Messiah. This is not praise, glory and honor given to Christ (although that is something which will happen, it is not what Peter is talking about), but the grace/power that is to be given to believers when Christ is revealed. See the Survey of Grace for the different aspects of past/justifying, present/sanctifying-enabling, and future/glorifying (and merited) grace, if you've never studied grace, or just use a concordance to study every occurrence of grace. Praise, glory and honor are rewards for faithful service according to both the gospels and the rest of the NT (as well as the OT), which can be forfeited through disobedience. This is why Peter told his readers to obey in verse 2 and will warn his audience to obey in verse 14. Remember the bookends of Romans: Paul was an apostle to bring about the obedience that should flow from faith. The believers to whom Peter wrote were rejoicing in their future reward, which they didn't see (which is why it is their hope), and that same dynamic was shown in their relationship with Jesus. They didn't know Him during His time on earth, but they love Him, they don't see Him in the present, but believe in His return and are rejoicing in expectation of it even in the midst of trials. The cause for rejoicing is because they are receiving the end goal (not initial stage) of their faith, the salvation/glorification of their souls (soul is put for life, as it is frequently translated, consisting of our mind, will and emotions, which Jesus said we must exchange for eternal profit -Lk 9:25 and all the other calls to discipleship). The end goal of our faith is not forgiveness, but glory, which reverses the effects of the Fall, and glorifies God (see Eph 1 comments). 1:10-12 This salvation (glorification) was something the prophets, who spoke of the grace that would come to them (e.g., Isa 40:13; 53; Dan 12:3) when they were searching for the time of the Messiah and His kingdom, in predicting the sufferings of Christ, and the glories to follow, wanted to know more about. The glories of the Messianic Age that followed His sufferings. It was revealed to them for the benefit of those who had the Good News or gospel preached to them (see comments on the gospel in Matthew 4 or Romans 1). Angels are very interested in the time when believers are glorified because they not only come to earth when Christ glorifies His faithful servants, but part of obedient believers' reward consists of ruling angels (1Cor 6:3). 1:13-21 In light of the future reward awaiting faithful believers, Peter exhorts his readers to strengthen themselves mentally, and be sound-minded (live their lives according to objectives not passions and emotions -see Titus comments), and set their hope fully (not half-heartedly) on the grace that will be brought to them at the revelation of Jesus the Messiah, at the inauguration of the Messianic Age/Kingdom. Note the grace is the reward given to them, then. At the risk of being excessively boorish, this is not a reference to the present possession of forgiveness, which born-again believers have currently as recipients of God's justifying grace (Eph 2:8-9; Rom 3:24-26). Born-again believers, with their hope set on their glory, should be obedient children to reap the inheritance of sons. They should not continue in their former desires for temporal things, but should be holy in all their conduct, reflecting the holiness of their Heavenly Father (Lev 11:44-45). God clearly judges each believer's works (2Cor 5:9-10) so we should live in fear (phobos, from which we get the English phobia) of not being holy, and of disobeying and therefore reaping negative consequences at the judgment seat. Being holy in all we do, means not doing what the worldlings do for temporal motives, but doing all for the glory of God. Peter's audience is reminded that they were redeemed from the useless, unprofitable, and not reward-gaining way of life handed down by the ritual of their ancestors, so they could live differently. Just like God redeemed Israel out of Egypt, so they could live differently. They were not redeemed by perishable animal blood, but with the precious blood of Jesus, who was planned (foreknown) from eternity past but revealed in the end times (from their perspective). The decision to send Christ to die for their sins, was part of God's plan before He made the world, not an emergency measure to rescue people from sin (see Eph 1 for the eternal plan of God to set up a Kingdom to reward with glory those faithful to Him). Through Christ, we are believers in God, who raised Him from the dead and gave Him glory, so our past faith (which secured our redemption) and future hope would be in God. 1:22 Believers have the responsibility to purify their souls (cf James 4:8). This didn't happen automatically at the cross, nor when we believed, but is a function of obeying the truth (means). Note that soul is put for life, the sum of what our mind, will/values, and emotions produce. We obey, or bring our lives into conformity with the truth, by the grace/power of the Holy Spirit, who works in us to will/desire and do/perform God's pleasure (Phil 2:13). He doesn't do it, we must by His power put to death the deeds of the flesh if we wish to live or have glory in the future kingdom (see Rom 8:13 comments). The major battle is against self-centeredness, living selfishly for our objectives. When we've purified ourselves by obeying the truth, we will have a brotherly affection for others, which we must employ in sacrificing ourselves for the benefit of others (agape love) as Jesus did for us. The reason Peter gives for such Christlike behavior is not just that we've been born again, but born-again out of the incorruptible seed of word of God, which not only implies growth and future life, but that word tells us something about our future. The word tells us that earthly glory lasts about as long as a cut flower in the grand scheme of things. Life is like grass, and man's glory is even more fragile and transient. But, the word of the Lord, which promised future glory in the Good News of the Messiah's Millennial Kingdom, endures, and is the glory preached to them. So they, and we, should fix our hope on it, and endure. Application: Have you purified your life by Holy Spirit empowered obedience so you desire to sacrifice your life for the benefit of others and the gaining of your eternal reward? If so, go for it. If not, fear. Prayer: Heavenly Father, thanks for the plans You have to bless me; may I be worthy of reward in Your kingdom, by doing what You desire here on earth. Amen. 4 coming to him, a living stone, rejected indeed by men, but chosen by God, precious. 5 You also, as living stones, are built up as a spiritual house, to be a holy priesthood, to offer up spiritual sacrifices, acceptable to God through Jesus Christ. 6 Because it is contained in Scripture, "Behold, I lay in Zion a chief cornerstone, chosen, and precious: he who believes in him will not be disappointed." 7 For you who believe therefore there is honor, but for those who are disobedient, "The stone which the builders rejected, has become the chief cornerstone," 8 and, "a stone of stumbling, and a rock of offense." For they stumble at the word, being disobedient, to which also they were set/appointed. 9 But you are a chosen/choice generation, a royal priesthood, a holy nation, a people for God’s own possession, that you may proclaim the excellence of him who called you out of darkness into his marvelous light: 10 who in time past were no people, but now are God’s people, who had not obtained mercy, but now have obtained mercy. 11 Beloved, I beg you as strangers and pilgrims, to abstain from fleshly lusts, which war against the soul; 12 having good behavior among the nations, so in that of which they speak against you as evildoers, they may by your good works, which they see, glorify God in the day of visitation. 18 Servants, be in subjection to your masters with all fear; not only to the good and gentle, but also to the wicked. 19 For it is commendable/meritorious if someone endures pain, suffering unjustly, because of conscience toward God. 20 For what glory is it if, when you sin, you patiently endure beating? But if, when you do well, you patiently endure suffering, this is commendable with God. 21 For to this you were called, because Christ also suffered for us, leaving you an example, that you should follow his steps, 22 who did not sin, "neither was deceit found in his mouth." 23 Who, when he was cursed, didn’t curse back. When he suffered, didn’t threaten, but committed himself to him who judges righteously; 24 who his own self bore our sins in his body on the tree, that we, having died to sins, might live to righteousness; by whose stripes you were healed. 25 For you were going astray like sheep; but now have returned to the Shepherd and Overseer of your souls. Observations: 2:1-3 In light of the plan of God to reward holy believers Peter exhorts his readers to get rid of all evil and hypocrisy and unedifying speech, and crave the nourishment of the word, like a newborn babe. This way they will grow with respect to their salvation/glorification. For those who don't understand the different aspects of salvation outlined in chapter 1, and incorrectly think salvation only means getting forgiven, this must be a confusing verse. How does one grow in getting more forgiven? Obviously, Peter meant to grow with respect to meriting the grace God plans to give faithful, and obedient believers, as noted in the first chapter. Peter's reason for this pursuit of growth and holiness is because they've tasted that God is gracious, and He's got a whole lot more grace to give. The rest of this chapter is going to tell believers how to do what is commendable/meritorious in the sight of God, so they can be rewarded. 2:4-10 Peter first notes the importance of living in unity with fellow-believers, as the Spirit of God chisels off their rough spots and shapes them to fit together into a spiritual house/temple (cf Paul in Eph 2:20-22 for the same imagery). 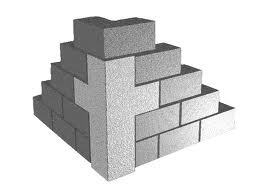 Jesus is the chief cornerstone, chosen/choice and precious in the sight of God, but rejected by men, just like them. NT believers are the new priesthood, whose job is to offer spiritual sacrifices to God through Jesus, rather than killing animals in the name of God as did the OT priests. To those who believe, there is honor, as Peter said in the previous chapter. 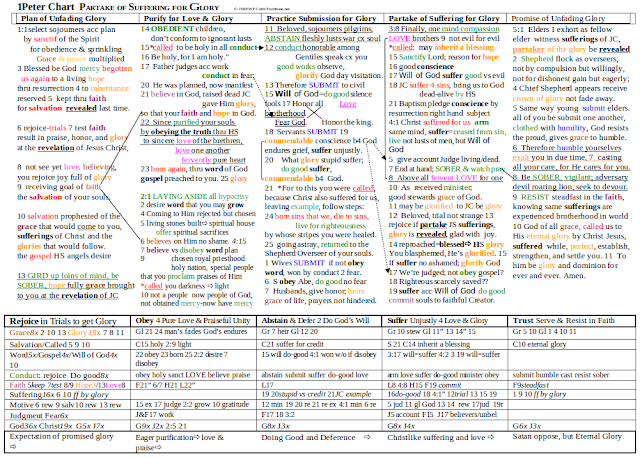 See the outline on Truthbase.net for NT sacrifices. Hebrews 13:15 Through him, then, let us offer up a sacrifice of praise to God continually, that is, the fruit of lips which proclaim allegiance to his name. 16 But don't forget to be doing good and sharing, for with such sacrifices God is well pleased. The cornerstone of the NT assembly, the Lord Jesus Christ, is not only the foundation of the church, but the stumbling stone over which those who reject God's revelation trip. The reason they stumble is because they are disobedient (not because they didn't believe nor because God didn't give them faith). Their stumbling is the consequence of their disobedience. The stumbling is the “appointed” or “set in place” consequence for those who disobey. People don't disobey because God “makes” them do so; they disobey because they choose to ignore His commands to be holy. NT believers are a choice generation (here generation is used for the whole group), a royal priesthood, in the line of Melchizedek (see comments on Hebrews 8), a holy nation (as opposed to the unholy physical nation), and a people that belong to God, so they can declare the praises of Him who called/summoned them out of darkness into His light. Just like Israel was summoned out of slavery in Egypt to the blessings of the Promised Land so they could sing God's praises, so NT believers should be praising God for His blessings. Those who had not received mercy (the common translation of the OT hesed or covenantal love), have now entered into that relationship with God. 2:11-17 Peter begs his readers to abstain from the desire for temporal things which will make them a casualty in the Christ-following life, and war against their souls, doing eternal damage. They won't get tossed into the lake of fire, but will have loss of inheritance and displeasing God to fear when He judges them (1:17). As NT priests, not only is inner purity required, but so is praiseworthy behavior among unbelievers. The Gentiles would consider Christians to be evil since they didn't worship the pagan gods. But if the believers lived according to Christ's purpose and commands, doing the good works for which they were saved (Eph 2:10) and for which the Scriptures equipped them (2Tim 3:17), the Gentiles would be attracted to Christ, become believers, and glorify God when He comes to judge (Mt 5:17). 2:18-25 Peter continues the theme of submission in the rest of this, and the next chapter, addressing servants (slaves/employees), commanding them to obey their masters with all fear, not only the good and gentle, but also the pointy-haired bosses of the world. If one can't obey them, it's time to look for a new job. For the original audience, who didn't have that option Peter encourages them with the reason, that it is commendable or meritorious (literally the word is “grace”- the reward talked about in chapter 1) if a person suffers unjustly because of seeking to do what is right in God's sight (keep a clear conscience). It's no glory (note the equation of grace with glory) if we suffer for our stupidity, but if we do what is good and suffer abuse, this earns favor/grace with God. This is merited grace or favor. It might be news to some folks, but this is the Christian calling (not to forgiveness by unmerited favor, but to merited favor/grace by good works). Who knew? Christ suffered unjustly to benefit us and do the Father's will, committing Himself to the Father who judges righteously, and will set everything right when He passes around the glory at the start of the Millennial Kingdom. We should do the same. When wronged unjustly, trust the infinitely just God to make it right. Jesus died for our sins, so that we having died to our sins, might live for the purpose of righteousness (doing what is right in God's sight). Peter reminds his readers of the fruit of the suffering of the Messiah in Isaiah 53. Christ's death was not just to secure forgiveness, but to heal us spiritually (from sick to holy) so that we might return from our straying to a relationship with the Shepherd and Overseer/Bishop of our souls (the two tasks entrusted to elders – see 1 Peter 5:1-4). Application: Believers must abstain from their temporal desires, and live for doing what is right in God's sight, trusting that He will recompense any injustice we suffer in order to obey Him. Prayer: Heavenly Father, thanks for sending the Lord Jesus to die for my sin, so I could die to them and live for Your blessing and glory. Amen. God in a nutshell: God will judge all people, rewarding faithful believers with grace and glory. Build-a-Jesus: Jesus died for our sins so we could have the Holy Spirit and the power to die to our sins and live for the pleasure of God. Us in a nutshell: We are born-again, which starts the spiritual life, that must be nourished by the word, and progress through abstaining from temporal desires, and doing the good works for which God saved us, so we can get the glory for which He created us.